I’m Keith Jenkins, Founder and Publisher of Velvet Escape, and I’m based in Amsterdam, The Netherlands. For a decade I had a very successful career in corporate and investment banking. Like many, despite my success, my career had begun to feel empty. Through circumstances I was able to leave and take time for myself, never anticipating that the collapse of the financial sector in 2008 would end my chosen career. Not one to allow circumstances to get me down for long, I have created an entirely new career for myself, following my passions for travel, writing and digital marketing in a way that I’d never realised was possible before. I wrote about my banker-to-blogger transition in my (free) ebook ‘Travelations‘ and spoke about it at my TEDxTalk titled “Passion. Empowerment. Social Media” in November 2012. Read about my favourite travel memories. ‘Velvet‘ is the context I’ve chosen for my travels. When you run your hand over velvet you know there is a certain depth and richness to it. That’s how I see my travels: varied, adventurous, luxurious and meaningful. Enjoying a cocktail at the beach in Rimini. Travel is my biggest passion and I’ve visited 80-odd countries (and counting) across six continents. To me, travel is an opportunity to unwind, enjoy a different rhythm and to explore new places and cultures. It is also about meeting the locals and fellow travellers, and sharing views, ideas and experiences. For me, travel is a never-ending source of adventure and inspiration. Read about what makes me happy when I travel. Getting soaked at the Brazil side of the Iguassu Falls! Preparing for a trip is the start of any travel adventure. I enjoy researching my destination before my departure as well as searching for great hotels. I’m a big fan of boutique and design hotels, and spas, but also of charming B&Bs and family establishments. In addition, cuisine is always an essential element of my travel experience and I love exploring a place to seek out the good eateries. I’m also a wine enthusiast who is always on the look out for great wines, especially on my visits to wine producing regions. In this sense, Velvet Escape is about getting away from our daily routines & exploring, being adventurous, reflecting & doing it in style. 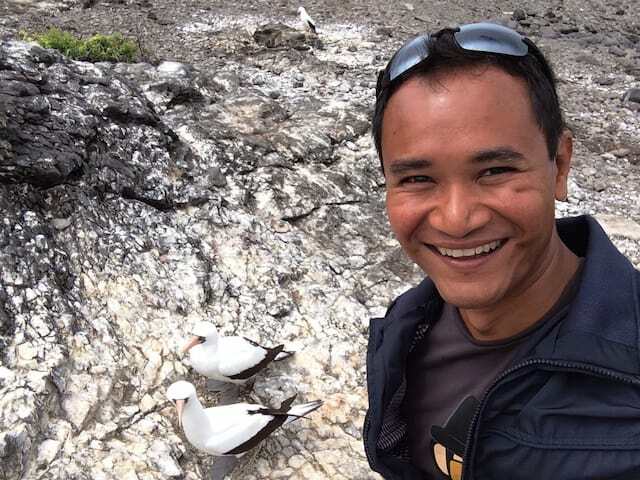 I couldn’t resist the temptation of taking a selfie with these Nazca boobies on the Galapagos Islands. In December 2008, I launched the Velvet Escape luxury travel blog. My aim with this blog is to share my travel interests and experiences, and provide my readers with travel tips and ideas. My interests include city trips, beach holidays, food & wines, nature, culture, architecture, art & design, aviation and history. Some of my favourite countries include Spain, Italy, South Africa, Austria, Germany, United Kingdom, Jordan and Malaysia. I hope to inspire people to travel, to stimulate their curiosity about the world we live in and foster an open mind that is receptive to different perspectives and new ideas. And to do all that in style! In this sense, Velvet Escape is a luxury travel blog but it goes beyond staying in five-star hotels or eating in Michelin-star restaurants. To me, it’s about the experience and what we gain from it. This is my definition of luxury travel. 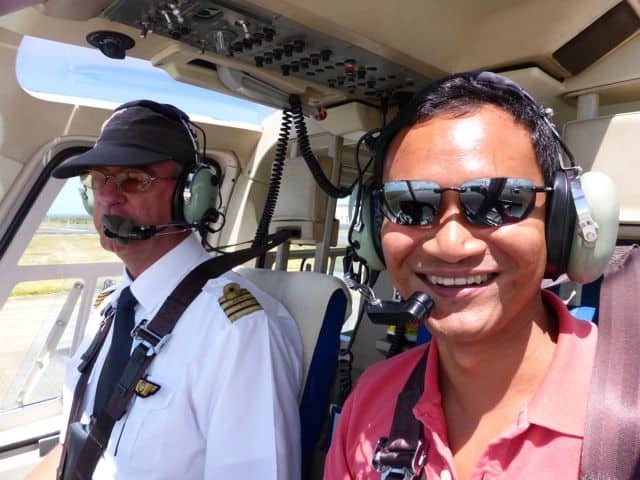 Ready for take-off for a heli tour of Mauritius. Velvet Escape has since become a multiple award-winning travel blog and has been featured by the likes of The New York Times, BBC Travel, Lonely Planet and National Geographic Traveler. Please see the Media page for a full list of awards, interviews and media mentions. Follow Velvet Escape on Twitter, Facebook, Pinterest, YouTube and Instagram. You can also follow my reviews on Google Maps and Trip Advisor. Visit the Velvet Escape travel photo gallery. Read my quick guides to places around the world. Read my posts about architecture. Read my posts about food and wines. Read my posts about hotels around the world. See my photos taken from plane windows. 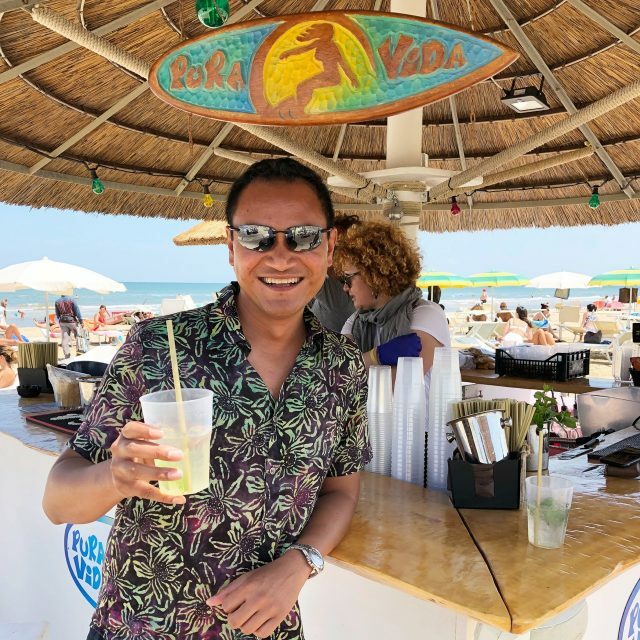 Since launching the Velvet Escape luxury travel blog, I’ve branched out into speaking at tourism fairs and conferences, travel blogging conferences and participating in tourism forums. In 2011, I started providing influencer marketing services to tourism boards and brands via iambassador. Since its humble beginnings, iambassador has grown to become a leading global network of professional travel influencers and our campaigns have won major awards around the world including back-to-back wins at the World Travel Awards 2017 and 2018 for “Europe’s Leading Marketing Campaign”. Our clients include tourism boards such as VisitBritain, German National Tourist Board, Emilia Romagna Tourism and Austrian National Tourist Office), and travel brands such as Expedia and Amadeus. In 2014, iambassador organised its first ever travel blogger conference, The Social Travel Summit. Aimed at professional travel influencers and content creators, this ground-breaking conference has brought travel influencers and marketing executives together every year since, in places such as Hamburg, Inverness, Kitzbühel and Belfast. In 2017, the Social Travel Summit won the PRWeek Global Award for Best Global Partnership between iambassador and VisitBritain. Dressed up Game of Thrones style at the Social Travel Summit Gala Dinner at St. Anne’s Cathedral, Belfast. View my LinkedIn profile for more information. Velvet Escape adheres to the STS Code of Ethics. Note: The Velvet Escape blog sometimes accepts compensation for advertising and sponsorship. The compensation received may influence the advertising content, topics, or posts made here in the blog. However, Velvet Escape pledges to provide honest and reliable content that reflects the true experience. All views are clearly those of Velvet Escape. The content on this site is for information purposes only. Velvet Escape has taken all reasonable care to ensure that the information contained on this site is reliable. Some of the activities listed on this site may involve elements of danger and participating in these activities is at your own risk. Velvet Escape takes no responsibility and is not liable for any harm or liability as a result of you or any third party participating in any of the activities listed on this site. Velvet Escape may run advertisements and promotions from third parties on this site. Your business dealings or correspondence with, or participation in promotions of, advertisers other than Velvet Escape, and any terms, conditions, warranties or representations associated with such dealings, are solely between you and such third party. Velvet Escape is not responsible or liable for any loss or damage of any sort incurred as the result of any such dealings or as the result of the presence of third-party advertisers on this site.